New Cool Collective is nearing its 25th anniversary and isn’t about to stop putting out classy, danceable albums either. One album, 2017’s Featuring Thierno Koité, is still lukewarm and another New Cool Collective release has rolled off the assembly line. Electric Monkey Sessions 2 is the NCC’s 12th release in its 24th year of existence as the dance jazz band that alto saxophonist Benjamin Herman and friends founded in 1993. It’s also the sequel to the exotica set of 2014’s Electric Monkey Sessions, named after Kasper Frenkel’s studio in Amsterdam, where the album was recorded. 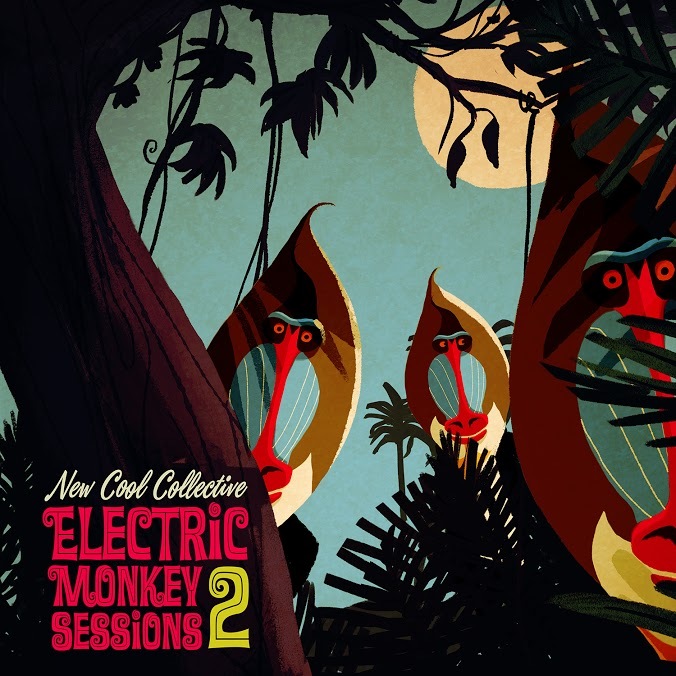 Eclecticism abound also on Electric Monkey Sessions 2, which comes as no surprise. Having said that, who could’ve been prepared for a tune such as Machu Picchu? A bubblegummy altpop tune consisting of a punchy backbeat, nifty keyboard line and probing reed and brass, it brings the ones who dig that stuff back to the music of acts from the early 00’s as Weezer and Tahita 80 and the ones who couldn’t care less about all this reference innuendo to the student pad y’all loved so dearly when you were forever young. The contagious Skalypso, perfectly Doe Maar-ish in nature, would make an excellent follow-up to the single release La Rana, the uplifting cartoonish hook that opens the album. The smooth soul of Ar Ping Talk, the sensual, perhaps sexually healing Marvin Gaye-meets-Idris-Muhammad exercise of Acapulco Gold and Afro-Jazz jams like Lanakwa and Max (the latter based on a Max Roach rhythm pattern) have as a common denominator the group’s nonpareil rhythmic expertise. Strikingly, Benjamin Herman’s commercially attractive NCC output and straightforward/avant-leaning jazz approach isn’t mutually exclusive, but rather re-enforces one another. Take Villachaize, the album’s exotic ballad and certainly a highlight, which reveals Herman’s liquid golden tone and heartfelt affinity with classic cats like Lou Donaldson and Johnny Hodges. Unbridled joy, bluesy romanticism. Electric Monkey Sessions 3 is probably not too much to ask. Find streaming and download services here. Check out NCC’s website here. And the new video of La Rana here.